These plates are used on vehicles operated in conjunction with farming activities. The farm must have gross annual sales of at least $2500, and the plates cannot be used on vehicles transporting goods for hire. 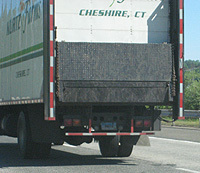 Use of Farm plates on trucks transporting the farm's own goods to market is permitted, however. Originally, these plates carried limitations on the distance from the farm the vehicles bearing these plates were allowed to operate. In 1978, the radius of operation was increased from within 7 miles of the farm to 25 miles. In 1985, this was increased again to 35 miles. Finally, in 1989, the mileage limitation was eliminated, but the prohibition on transporting goods for hire and minimum annual sales requirements were enacted. Starting in 1996, Farm plates could be issued to passenger cars as well as trucks. This type started in 1933, probably as a means of relief to farmers during the Great Depression. Up until the mid 1960s, these plates were always distinctively colored- probably to help eliminate misuse of these reduced/no fee plates. In 1946/47 a small number of these plates were made with black numbers on a light olive green background. Shortly thereafter, the colors went back to the previous black on yellow scheme. In the late 1950s and early 1960s, date tabs were used to designate the year. However, I have seen a white on green farm plate with a '62' embossed year. In 1985 or 1986, Farm plates became biennial registrations. Prior to this, they had to be renewed every year. When the graphic 'blue fade' plates were introduced, there were 2 varieties of farm plates - some had blue numbers, and some had red. It appears that a number of re-made plates in the "F" types (Factory, Farm, Fire Apparatus) were mistakenly manufactured with blue instead of red numbers. Reference: Chapter 246 Sec. 14-49 (q). One of the odd short-lived light green background plates. I'm not sure whether these plates were supposed to be used through 1968, or whether the owner put the stickers from the plate on the right on his old plates above. Also note the odd position of the dot - seems like right after they started making the 5-number plates they needed to get a feel for where the dot belonged. ca. 1966 or so. The change in dies happened somewhere between these two plates. Terrible shape, but I received this plate with a pile of others so I might as well display it here.